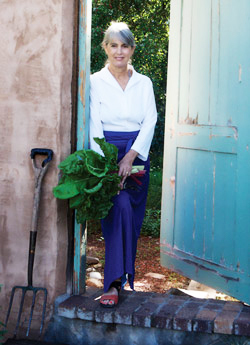 For more than 35 years, Deborah Madison has been an ardent vegetable evangelist, starting from her early days cooking at Chez Panisse and then founding Greens Restaurant. Among her numerous books, Vegetarian Cooking for Everyone is a trusted essential for many home cooks. She is also a strong advocate for farmers markets, seasonal cooking, and heritage seeds. As the daughter of a botanist, Madison inherited a natural curiosity for the plant kingdom. 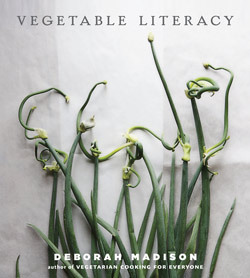 In her latest book, Vegetable Literacy (Ten Speed Press, 2013), she unearths the botany, history, and culinary connections within 12 plant families. From her home in New Mexico, she talked with CUESA about her discoveries in the garden, how understanding plant relationships can help us be more confident cooks, and why a radish top is a terrible thing to waste. CUESA: What was your inspiration for writing this book? CUESA: How can spending time in the garden help us be better cooks? DM: The garden helps you get things into view. Whether you have potted plants or a big garden, relating to growing plants can inspire you to ask questions and discover similarities. Then, when you use those plants in the kitchen, you know more about them. For example chard, beet, spinach, and quinoa are all in the same family (Amaranthaceae), and their leaves taste similar. As you note these flavor relationships, you might say, “I don’t happen to have chard, but I’ve got beet greens. I think I’ll use those instead.” You’ll be fine. Spinach is going to cook down more than chard and less than beet greens, but the flavor essence is there. And the same is true of wild spinach, or lamb’s-quarters. CUESA: There are some surprising plant relationships, like asparagus having once belonged to the same family as onions. What were some of your favorite discoveries? DM: The daisy family (Asteraceae) is one that I find to be especially interesting and strange. My father was a botanist, and before he died, his memory had pretty much gone. I showed him pictures of the plant families, thinking it would be amusing for him. He was not interested at all until we got to the Asteraceae family. He paused and said, “Looks like some rough stuff from the out of doors.” I thought that was so beautiful, and so right on! It’s true. Asteraceae is a rough and challenging family, and I like that about it. You have prickly artichokes, cardoons—which are like saws when you work with them—and other bitter plants. You also have lettuce, which takes on a bitterness as it matures and bolts. The flowers of these plants, like asters, daisies, and sunflowers, are the most innocent-looking blooms, but there’s a bitterness and difficulty in the vegetables. CUESA: For those of us who don’t have gardens, how can understanding relationships between plants help us be more informed food shoppers and eaters? DM: You don’t have to have a garden. In the book, I try to distill some essential relationships among plants, so that when you go to the market, you’re armed with that knowledge. You can ask a farmer, “Are these two things related?” You can also learn a lot by visiting a botanical garden or taking a farm tour, where you can see vegetables growing. The farmers market or grocery store is like a butcher counter for vegetables. You just see parts and pieces of plants. I know it’s impractical, but I wish more farmers would bring the whole plant or more of the plant to market—such as a big cardoon leaf, a whole cabbage plant, or a leek with its three feet of flags. People would say, “Oh, really! That’s what that plant looks like.” And they’d be awed. 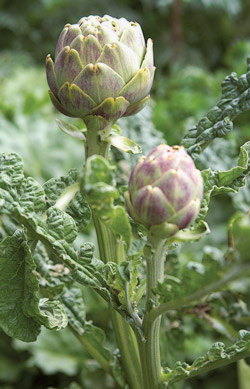 CUESA: In the book, you provide tips for using the whole plant. How does food waste fit into your cooking philosophy? DM: People talk a lot about food waste, and it’s usually on the level of cooked food that gets thrown out at home, restaurants, or schools. There’s another kind of waste in using just the choice parts of the plant. It’s like eating steak all the time, instead of an arm roast or kidneys. 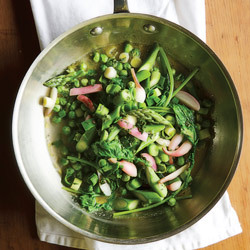 We ignore the fact that radish leaves have much more nutrients than the root, and you can use them in a salad or soup. Maybe you don’t want to eat the gnarly, prickly, or yellowed ones, but here’s a food that we easily have access to that we don’t use. I just saw a recipe in a food magazine for cauliflower, and the first thing it said was, “Cut out and discard the core.” The core’s absolutely delicious, and it’s food, so why throw it away? When you grow food yourself, you’re not careless, because you’ve invested so much of your energy in growing it. You begin to question, “Hmm, I wonder if I could eat this or that part?” In Santa Fe, we have a farmer who started bringing broccoli leaves to the farmers market. He made up a name for them, “broccoli kale.” He had discovered you could eat the whole plant and started thinking, “Why am I throwing these leaves out?” And people bought them! CUESA: Do you have a cooking motto? DM: I don’t have a motto, but something I’ve been living by a lot more is, “If you don’t have it, figure out something else.” I live in the country, where it’s a 15- to 20-minute drive to the market, so I never get in the car and drive in order to buy an ingredient. So often our pantries become part of our landscape—those jars of beans—and we don’t really see them after a while. They’re almost decorative. But not running to the store all the time opens up so many possibilities, including eating what you have in the cupboard or the garden. And see her speak next Wednesday, April 17, at Omnivore Books. Photos by Christopher Hirsheimer and Melissa Hamilton, courtesy of Ten Speed Press.